« Are You Ready to Make Some Bold Changes? Every year, when this truly green holiday rolls around, I can’t help thinking about Leprechauns and the pot of gold at the end of the rainbow. If we were honest about our hopes and dreams when we started our businesses, I think most would admit that a part of those dreams included making enough money to pay the bills, help out a family member, or easily donate to a favorite charity without thinking twice about it. There would be enough money to go around. But while we are still being honest, I am guessing that the same group would follow-up by sharing that money is not their true measure of wealth. Wealth for me, is being able to positively impact the lives of others. In my business, that means teaching women how to develop businesses that leverage their greatest assets. With regard to my family, that means having close relationships with my parents, my sisters, and all my nieces and nephews. And with my friends, that means staying in touch even across the miles, and being there when one needs a shoulder to lean on. 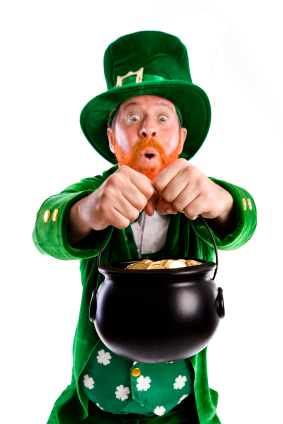 So in honor of St. Patrick’s Day, if not a pot of gold, what is your true measure of wealth? This entry was written by Dr. Shannon Reece, posted on March 17, 2011 at 6:00 am, filed under Aspiring Entrepreneurs and tagged businesswoman, entrepreneur, St. Patrick's Day, startups, strategies for women, wealth. Bookmark the permalink. Follow any comments here with the RSS feed for this post. Post a comment or leave a trackback: Trackback URL.